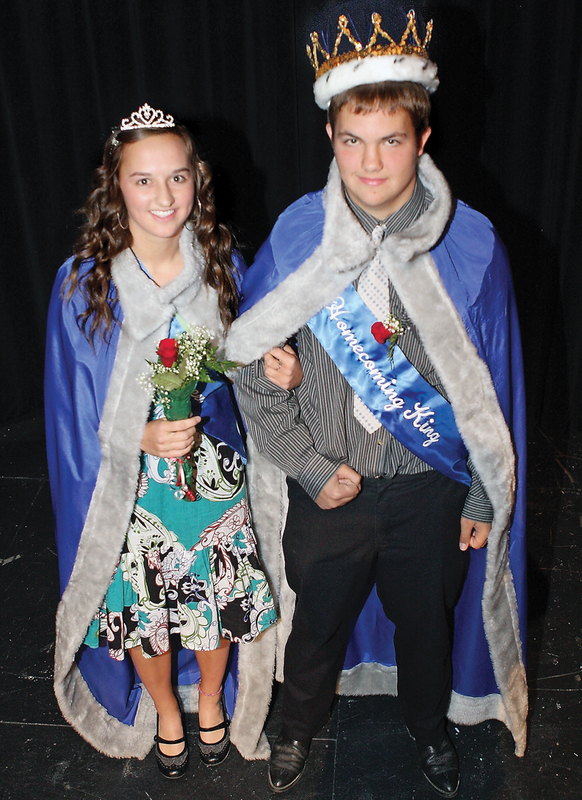 Seniors Katie Ellgen and Michael Pankey were crowned the 2010 Moffat County High School Homecoming queen and king on Thursday morning during a coronation. Ellgen and Pankey will attend the Homecoming parade, games, cardboard boat regatta and dance. Cherratina Pankey stood Thursday morning on the Moffat County High School auditorium stage holding her son’s new crown. Her eyes were wet with tears. She had just witnessed the 2010 Royalty Coronation ceremony in which her son, MCHS senior Michael Pankey, had been crowned Homecoming king. Michael had just taken yet another step in his late father’s footsteps, Cherratina said. “He was prom king his senior year,” Cherratina said of her late husband, Don Pankey, who died from brain cancer in April 2008. “We miss him,” Cherratina said. On Thursday morning, MCHS named 10 students, two teachers, and two alumni as this year’s Homecoming royalty before an enthusiastic crowd inside the auditorium. The event coincided with Cowboy Day, a dress up day, which gave students in the audience cause to whoop it up Western style. Delaine Brown, MCHS registrar and student council advisor, said the rowdiness Thursday was “typical” for the annual event. But, she said the audience was respectful. MCHS faculty picked royalty nominees from each class, Brown said. Students elected the winners. Student Council President Slade Gurr said the student body made good choices. Homecoming Queen Katie Ellgen said she wasn’t sure why she was nominated and later elected. Ellgen said getting ready for the coronation was almost an afterthought Wednesday morning. “I was mostly getting ready for Cowboy Day and then I was like, ‘Oh yeah, the dress,’” she said. Pankey and Ellgen will attend the Homecoming parade, Homecoming games, cardboard boat regatta, and the Homecoming dance. Cherratina said the coronation was “cool,” especially because of the emerging parallels between her son and late husband. Don Pankey, a 1972 MCHS graduate, played for the football team and wore jersey No. 75. Now, 40 years later, Michael wears that same number.